Congress has finally seen the light and reopened the government. Thank goodness, it was starting to get really weird here in the capital of the United States of America. Living in and around the Federal City is usually pretty cool because there are lots of bike trails and parks and rivers and monuments. I live just outside the District of Columbia in Virginia, which is also weird in a more disturbing way. But we have lots of county supported parks with great mountain bike trails. Across the Potomac River in Maryland, the same is true. We were living in a fool's paradise, however. 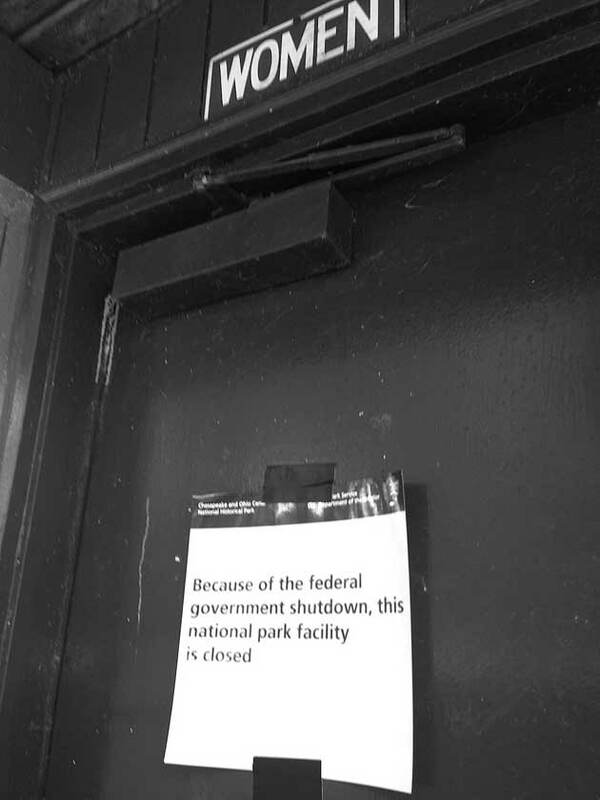 When the federal government shut down, many of our favorite trails were closed because they were on federal property and maintained by federal employees. For a few days we fretted, but being good citizens of a free nation we soon got antsy and started taking things into our own hands. You probably saw the TV footage of the guy from Maryland who took his lawnmower to the Lincoln Memorial and cut the grass around Honest Abe's ankles. Angry WWII vets who were flown in to see their wonderful new memorial on the National Mall pushed back the barricades and liberated another nation under the thumb of fascists. One of those things you never missed until it was gone. Thankfully, congress has opened our nation’s crappers again. Good work, guys… Photo by Sal Ruibal. Autumn is the best time to ride along the scenic C&O Canal Towpath that parallels the Potomac River to Great Falls (which really are great) and eventually will get you to Cumberland, Maryland and a northward jaunt to Pittsburgh, where the locals are known to enjoy a beer and a bike ride in the Penn woods. That first Sunday after the closure, we decided to be good small-d democrats and take advantage of a warm, sunny day on the Canal Path and perhaps pick up trash and deliver it to dumpsters outside of the no-fun zones. We met no resistance at the open gates, rode about 25 beautiful miles and met about 100 or so fellow travelers, including two groups of riders who had made the trip upstream from Pittsburgh. They were already en route to DC when the gates closed, but they just kept riding. The biggest problem they and we had on that mellow day was not the fate of our nation, but a place for urination: All of the restrooms were locked because there was no one to clean them and fend off toilet looters. For guys, this is not a problem. Under the gaze of the Secret Service, I peed on a tree at the Texas White House when I rode with President Bush. But for women, not having a toilet is more of a problem. We have a friend who doesn't think twice about watering the daisies, but she is a U.S. Army Colonel, Airborne Ranger and former Delta Force member. She can do what ever she wants. Yes, ma'am! The only trash we found was a crumpled Dasani water bottle, which was evacuated from federal custody in a little plastic bag and sent to the CIA for use in future waterboarding sessions. 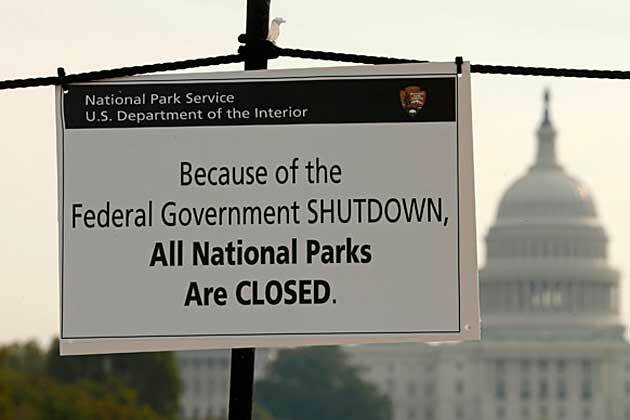 The People didn't need to be shut out of their parks and trails, but the big meanies who never go to those places anyway had their underpants in a twist and assumed we would meekly go home and wait for Fox News to let us know when the coup d'etat was complete. It is a trait of Americans to right a wrong when they see it and to give aid when it is needed. In the weeks that the federal government was closed, bike riders all over our nation jumped in took care of our real national treasure: fresh air, clean water, trails to ride and a nearby Porta-Potty. The walls of Jericho have crumbled. Get out there and ride. God Bless America and Bicycles!